Maritime container ports tend to be part of a larger port, and the biggest maritime container ports can be found situated around major harbours. 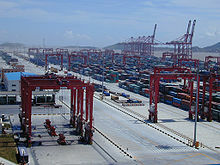 Inland container ports tend to be located in or near major cities, with good rail connections to maritime container ports. Both maritime and inland container ports usually provide storage facilities for both loaded and empty containers. Loaded containers are stored for relatively short periods, whilst waiting for onward transportation, whilst unloaded containers may be stored for longer periods awaiting their next use. Containers are normally stacked for storage, and the resulting stores are known as container stacks. ^ Krzysztof Lewandowski (2014). "Czechoslovak activity to prepare European norms for containers before the Second World War" (PDF). Acta Logistica. 1 (4): 1–7. ISSN 1339-5629. ^ "History". Port Authority of New York and New Jersey. Retrieved 2014-12-23. ^ "APM Opens Most Advanced Container Terminal". Retrieved 2016-09-21. ^ Dirk Steenken; Stefan Voß; Robert Stahlbock (1 January 2004). "Container terminal operation and operations research - a classification and literature review". OR Spectrum. Berlin / Heidelberg: Springer-Verlag. 26 (1): 3–49. doi: 10.1007/s00291-003-0157-z. Retrieved 2010-09-07. ^ Robert Stahlbock; Stefan Voß (1 January 2007). "Operations research at container terminals: a literature update". OR Spectrum. Spring-Verlag. 30 (1): 1–52. doi: 10.1007/s00291-007-0100-9. Retrieved 2010-09-07. 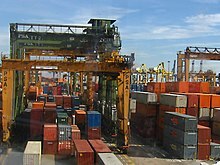 Wikimedia Commons has media related to Container terminals.